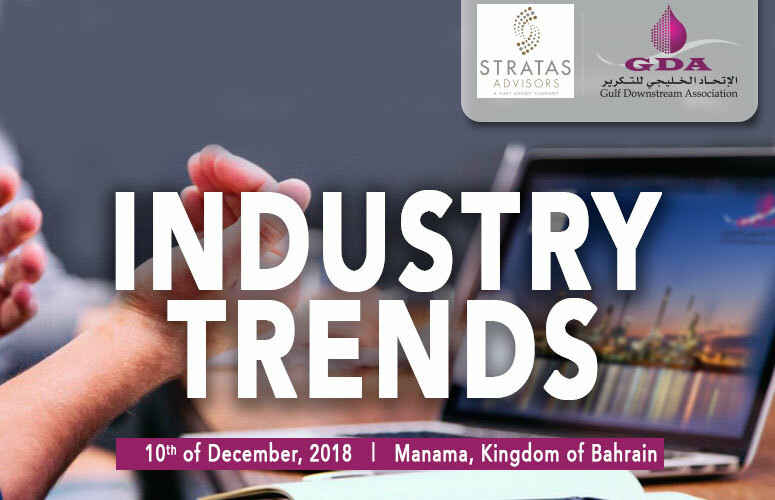 The symposium provides a forward-looking assessment of the oil & gas industry across the entire value chain – upstream, midstream and downstream -- and related industries including transportation and petrochemicals. Furthermore, the implications for the GCC region will be considered. The symposium will be focused on highlighting and assessing developments pertaining to the downstream and petrochemical sectors, which will of the most interest to mid-level and senior-level professionals who are supporting decision-makers or are themselves decision-makers. For more information and registration, please email Ms. Noor Talal at noortalal@gda.org.bh or call +973 1711 6007. Mr. Paisie is responsible for managing the study & consulting business worldwide. Prior to joining Stratas Advisors, Paisie was a partner with PFC Energy, a strategic consultancy based in Washington, D.C., where he led a global practice focused on helping clients (including IOCs, NOC, independent oil companies and governments) to understand the future market environment and competitive landscape, set the appropriate strategic direction and implement strategic initiatives. He worked more than eight years with IBM Consulting (formerly PriceWaterhouseCoopers, PwC Consulting) as an Associate Partner in the Strategic Change practice focused on the energy sector while residing in Houston, Singapore, Beijing and London. He was also a leader in the Mergers & Acquisition Practice, and participated in several transactions. As an expatriate, he lived in Southeast Asia, China, the Middle East and China while worked extensively in Latin America. He started his career as an engineer with Sun Oil and worked as a project manager for Saudi Aramco before moving into strategy consulting. He earned his Bachelor of Science degree in engineering from the University of Toledo and his MBA from Purdue University. Mr. San has more than 7 years of experience in downstream refining and petrochemical consulting practice. San’s downstream industry research and consulting practice is centered on Asia Pacific region. San started his career as a Senior Analyst with FACTS Global Energy (FGE) in 2006 and spent more than three years between 2011 and 2014 working with oil and chemical shipping consulting companies including Drewry Maritime Services (Asia) Pte., Ltd. Prior to joining Stratas Advisors, he was an oil market consultant with KBC Advanced Technologies Pte., Ltd from 2015 to 2017. Before joining FGE, San has worked with ASEAN Chambers of Commerce and Industry (ACCI) and market research companies. San received his first degree from Yangon University majoring in International Relations and Master in Public Policy from the National University of Singapore.